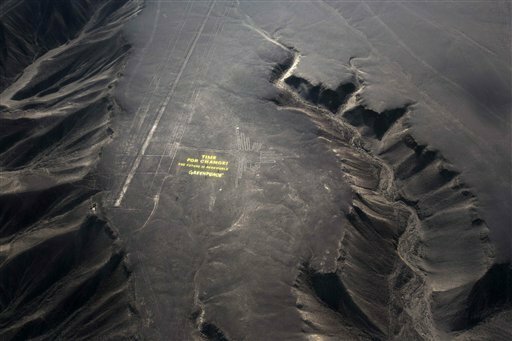 LIMA, Peru (AP) – Peru will seek criminal charges against Greenpeace activists who damaged the world-renowned Nazca lines by leaving footprints in the adjacent desert during a publicity stunt, a senior government official said Tuesday. “It’s a true slap in the face at everything Peruvians consider sacred,” Deputy Culture Minister Luis Jaime Castillo said of Monday’s action by the environmental group at the famed drawings etched into Peru’s coastal desert, a U.N. World Heritage site. He said the government was seeking to prevent those responsible from leaving the country while it asks prosecutors to file charges of “attacking archaeological monuments,” a crime punishable by up to six years in prison. The message was intended for delegates from 190 countries at the U.N. climate talks being held in nearby Lima. Castillo said no one, not even presidents and Cabinet ministers, is allowed without authorization where the activists trod, and those who do have permission must wear special shoes. Greenpeace spokeswoman Tina Loeffelbein said that the activists were “absolutely careful to protect the Nazca lines” and that the group is taking the case seriously and investigating. She declined to answer further questions, such as whether Greenpeace intends to identify to authorities the people involved. The government has asked people to do so. Greenpeace regularly riles governments and corporations with actions that sometimes lead to arrests and jail. In March, seven activists were arrested for unfurling banners from the roof of the headquarters of Procter & Gamble Co. to protest the corporation’s use of palm oil that Greenpeace linked to rainforest destruction. A lawyer for the seven said last week that they would plead guilty to lesser charges of criminal trespass to avoid a trial on felony charges.